Job-hopping will catch up to you. Here's how to end the cycle. Job-hopping will catch up to you. Here's how to end the cycle. In fact, it was one of the most controversial posts I think I’ve ever put out there. Some of the comments I got back were very much in disagreement with me. I wasn’t saying that anyone should stay in a toxic environment. In fact, I founded my company to help startups create environments that aren’t. 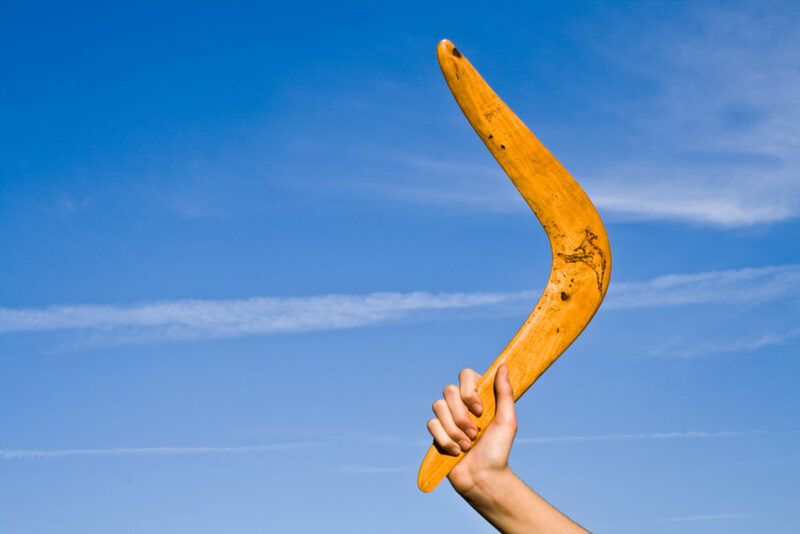 The real spirit behind my post was this… moving around too much is a boomerang that eventually will come back to haunt you. Whether the job market is in our favor or not. Why job hopping is deadly… even when the job market is in your favor. 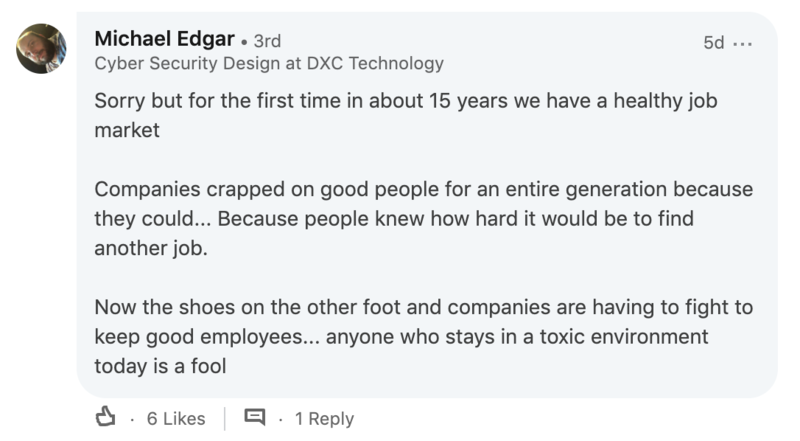 As one commenter on my post astutely called out, the real problem here is that we don’t know how to figure out if a company is a good fit for us before we join. I get it. It’s not easy to see behind the curtain – even when we know we need to. But the hard truth is, knowing how to choose an employer is a big indicator of your abilities as a salesperson. The data shows that discovery is probably the biggest indicator of whether a deal close (or not). 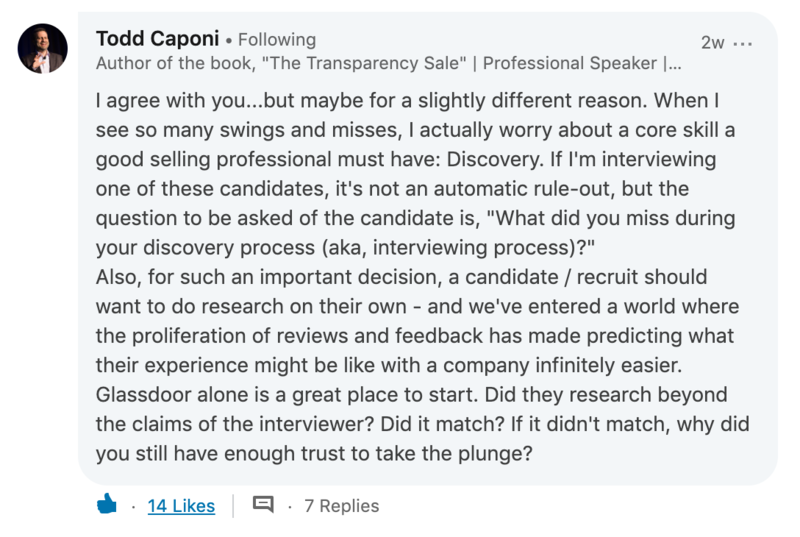 But when you’ve job hopped a lot, that sends all kinds of signals to savvy sales leaders (the kind that you actually want to work for) that you don’t know how to do discovery well. In fact, one of our new clients specifically said they would not consider anyone who had been at three companies in the last four years for this very reason. It’s easy to get a sales job right now, true. But finding the standout role where you can really shine is a whole other ball of wax. Heres’ the thing – it can take as much as 6 months just to ramp up and start hitting your numbers (sometimes up to 2 years in enterprise sales). And since your numbers (and how you achieved them) are your proof that you know what you’re doing… how can you sell yourself if you can’t show them how you deliver? 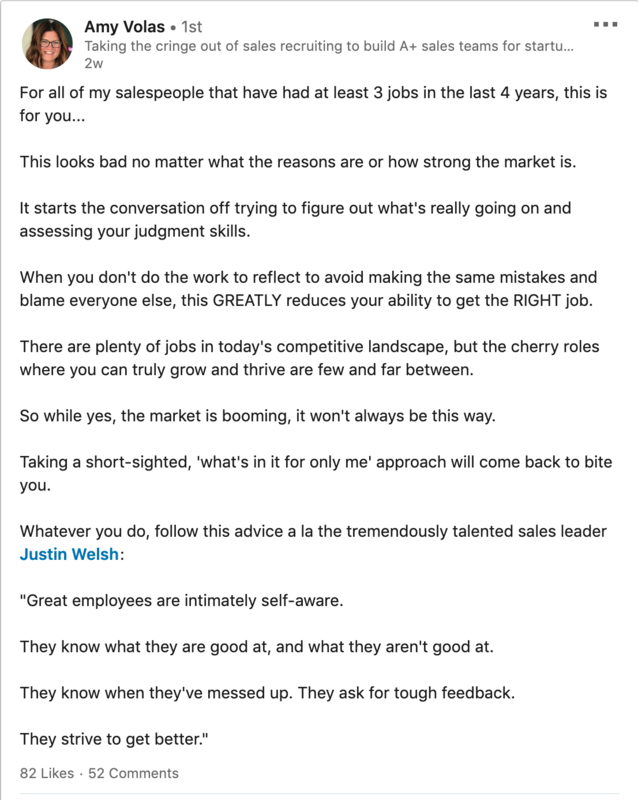 When you go multiple years in a row without sticking around at any one company, you never build the track record that strong companies use to determine how talented you are or not… again, especially in enterprise sales. Then picture the market taking a dive and all of a sudden there aren’t as many jobs to go around… you’re going to be behind. How to know if the company you’re interviewing with is a place you’d thrive. Here are the key areas I’ve seen be most critical in determining whether a new opportunity is a place you’d thrive. 1. Do you believe in the product/service? It’s been said that the first sale happens in the heart of the salesperson. I think that is exceptionally true. It’s hard to sell something you don’t believe in! So in interviews, make sure to spend time discussing what the product does, who it’s for, and why it’s so effective. But also take that one step further – look for proof in the form of product-market fit. It’s one thing for them to tell you a good story about what the product’s intent is… it’s another thing altogether for that story to verified by real sales/customer data. 2. Is the culture one that will set you up for success? If there’s anything I’ve learned as a buyer, it’s that the sales process is the best indicator of what it’s going to be like to be a customer. The same goes for the interview process. Your experience as a candidate is the single best indicator of what it will be like to work there full-time. And the tells are in the little things. Take a look at these two interview scenarios below (just so you know, these are real-life examples)… which one would you feel best about? If I had to choose, it’s pretty clear to me that Company #2 is the one where I’m more likely to find a strong culture that is going to set me up for success. The way they communicate, the way they act, etc. All these little things add up to show me that they actually value what I bring to the table and care about me as a person. It’s pretty common to see companies put on a good face during interviews to get talented people in the door, only to remove the mask later. But one of the best ways to sniff out this kind of scenario is to get specific and pay attention to their responses. Are they willing to let you meet with the team and ask questions? Do they show you the product, warts and all? Do they show you real sales numbers and explain why they are the way they are? Are they honest about the challenges you’re going to face if you join the team? These are all great indicators of what they are like as leaders. And since culture starts from the top down, it’s also a good indicator of what that’s going to be like as well. 4. How many of their reps are already successful? Modern-day sales is a team sport. But if the team isn’t winning, it’s not a good sign you’re going to succeed either. It doesn’t mean you won’t… it just means you need to get clarification on why the team is doing what they’re doing. There are certain things you can’t fix and shouldn’t try to – like a product issue or a leadership issue. However, if the right leadership and product are in place and they just don’t have the right reps, it could be a great opportunity for you to shine (e.g. this is exactly the story of one of the clients we’ve worked longest with – they’ve since 5x’d their revenue). So the most important takeaway here is to make sure you understand why their reps are or aren’t successful. And not just the top rep but all of them… some companies will try to fool you into thinking they are more successful then they are this way. I’m not saying you should stay in a toxic environment. But I am saying that if you’ve been through multiple jobs in the last few years and it’s always the companies fault, it’s probably time to look in the mirror. No matter whose fault it is that you left, it still reflects poorly on you. Your track record (or lack thereof) will come back to bite you when the market turns… if it hasn’t already. So take time to reflect and ask those around you that you trust to be real with you where you can improve!